It’s been a while since I participated in the wonderful Sweet and Simple Bakes monthly challenge. I always start off with good intentions but then before I know it, it’s the first of the month and I’ve gone and forgotten all about it. This month I was determined to make the deadline, I was going to join in, I had to! And how better to adhere to a looming deadline? Make it well in advance of course! I only wish I lived by these rules while at uni. When I saw what was on the menu for this month, well I couldn’t help but bake them super early! So early in fact, I had them baked and eaten on the 2nd of August, check my bad self out. Jammy doughnut muffins, how could you resist such a thing? I had the majority eaten before they even had time to cool. I made these muffins with my homemade Strawberry and Gooseberry jam for even more of a home made feel. You will need 12 hole muffin tin lined with paper cases. Sift the flour, baking powder and salt into a large mixing bowl, and stir through the sugar. In large jug, lightly beat the eggs then add the milk, cooled butter and vanilla extract and beat together. Pour the wet ingredients into the dry ingredients stir gently until just combined. (Do not over mix, its fine to have a few lumps in the mixture.) Spoon half the muffin mixture into the base of each paper case. Top each muffin with a teaspoon of jam. Now equally between each paper case, top with the remaining muffin mixture. Bake in the preheated oven for 15 – 20 minutes until well risen, golden and firm to the touch. For The Topping: melt the butter in a saucepan over a low heat. Spread the granulated sugar in a wide, shallow bowl with the cinnamon if using. When the muffins are baked, leave in the tin for 5 minutes. Dip the tops of the muffins in the melted butter and then roll in the sugar. You can serve these muffins warm or cold; however, I do prefer to eat them whilst warm. Oh, yum. Your cupcakes look and sound delicious. The homemade jam sounds great!! And special congratulations for making them WELL before the deadline – you win the prize.I was always rubbish with deadlines at uni. They always got in on time but not without a flurry of panic in the days before! Wat a gorgeous muffins, beautiful presentation Katiecakes! Mmmmm. Muffins with jam, butter and sugar? That sounds absolutely delicious. Don't we all wish we applied ourselves a little more in Uni? If I had these muffins to sustain, I'm sure I could have! Dead jealous!!!! Look how great your presentation is! I bet they tasted even better than they looked too. I love your blog!!! I've dropped by before and plan to drop by more often.What did you use to display the muffins? It's a beautiful display! These were awesome. Nothing beats home made jam. Now, I don't have the opportunity to find out how gooseberry jam taste like. Not avail in this part of the world. Lucky you. Those look like breakfast perfection and sound like they'd marvelous right out of the oven. I would like one of these with tea too, please. With the homemade jam – delightful! Yum! 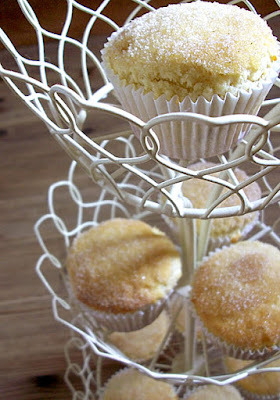 Bonus points for homemade jam too!I love the cupcake tree and your new design, just lovely!